Grindhouse includes Kontakt 5 Player. See details tab for complete patch list. Grindhouse is a collection of edgy, lo-fi, and retro-cool multi-sampled instruments with loads of character and a unique 1970s exploitation movie vibe. Our goal in creating Grindhouse was to produce a virtual instrument that had the same feel as those old exploitation films: a VI that is so bad, it's good. This library is a collection of instruments that sound like they were sampled from old vinyl LPs and recorded off a bad copy of an obscure 1970s exploitation film. We watched a lot of old exploitation films from the 1970s, and set out to replicate some of the vocal and instrument sounds that were used in those films. Take a look at the patch list below and you'll find such B-Movie soundtrack classics as Spaghetti Western Electric Guitar, Melodramatic String Section, 1960s Cliche Jungle Movie Drums, several patches of audio clips taken from actual (public domain) Grindhouse flicks, and lots more. Grindhouse is designed for use in all sorts of Indie-style productions, or any project that calls for a lo-fi or “home-made” vibe. Whether you're a songwriter, a producer, or a composer working on TV, film, or video games, Grindhouse can be used to add grit and character to your music. 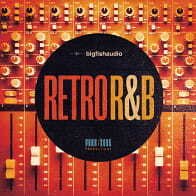 You can use it to create loops, tracks, or entire songs that have a funky, crate-digger type of vibe. 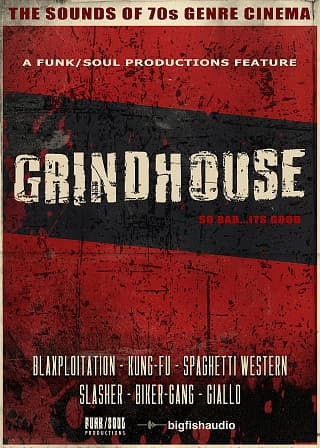 And of course, Grindhouse is ideal for scoring your very own retro-style Kung Fu, Spaghetti Western, Biker Gang, Girl Gang, Women in Prison, Pinky Violence, Low-Budget Horror, Italian Crime, Japanese Yakuza, or Blaxploitation B-movie soundtrack. Shocking! Raw! Uncensored! Play these instrument-patches at your own risk! - Spaghetti Western Whistling - it's Good, Bad, and Ugly. The Following End User License Agreement is included with Grindhouse. This License is only valid for the individual who has purchased an unopened, new and lawfully made copy of Grindhouse from a dealer or distributor authorized by Big Fish Audio. "The following End User License Agreement is included with Grindhouse. This license is only valid for the individual who has purchased an unopened, new and lawfully made copy of Grindhouse from a dealer or distributor authorized by Big Fish Audio. "End User License Agreement: The samples contained herein are licensed, not sold to you, the individual end user, by Big Fish Audio. This non-exclusive, non-transferable license is granted only to the individual end user who has purchased an unopened, new and lawfully made copy of this product from a dealer or distributor authorized by Big Fish Audio. 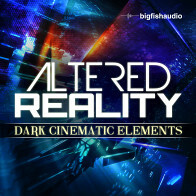 All samples remain the property of Big Fish Audio and are licensed only for use in the creation of a live or recorded performance that includes the licensed samples as part of a derivative musical work created by the licensed end user. This license expressly forbids resale, rental, loan, gift or transfer of these samples in any format or via any medium, except as part of a derivative musical work. The samples may not be included, whether unmodified or as part of a derivative work, in any sample library product. Any unlicensed usage will be prosecuted to the maximum extent possible under the law."" 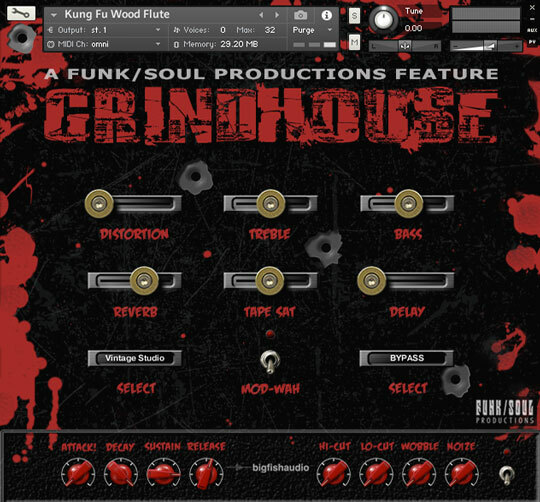 Produced in collaboration with Funk/Soul Productions, Grindhouse is a 13GB Kontakt Player library of multisampled instruments, clips and loops with a 60s/70s ‘exploitation’ cinema theme - think spaghetti Western, kung-fu, horror and sci-fi B-movies. Doubling down on niche virtual instruments, Funk/Soul release Grindhouse – a spot on tribute to the sounds of B-Movie scores of the 70s that is sure to inspire!